Reuters//Maxim ZmeyevA pro-Russian separatist stands guard during the self-proclaimed Donetsk People’s Republic leadership and local parliamentary elections. The Russian government has officially recognised elections in rebel-held Donetsk and Luhansk regions in eastern Ukraine despite UN warnings that they violate the peace agreement in the country. Russia also looks like it is beginning another military buildup on the Ukraine border. 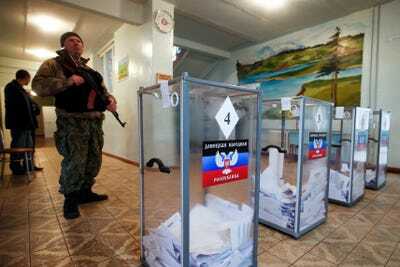 While the votes are pro-Russian, they could also become a huge headache for President Vladimir Putin. Further escalation in the region could dash Moscow’s hopes of a loosening of international sanctions next year and plunge the country into a recession. Results in this morning show Aleksandr Zakharchenko, the prime minister of the self-proclaimed, pro-Russian, Donetsk People’s Republic, comfortably won with 765,340 votes, or around 80% of total ballots cast. The result in Luhansk is due in later today but is also widely expected to go in favour of the incumbent leader of the pro-Russian Luhansk People’s Republic, Igor Plotnitsky. However, Russian Foreign Minister Sergey Lavrov’s claim that the elections were held in line with the Minsk agreements was contradicted by the international community. Russian news service Tass reports that UN Secretary-General Ban Ki-moon believes the votes were incompatible with the peace deal while both the US and the European Union have also refused to recognise the elections, dubbing them “illegal and illegitimate“. More worryingly, over the weekend, a Ukraine government spokesperson briefed journalists that there had been “intensive deployment of military equipment and personnel of the enemy from the territory of the Russian Federation onto territory temporarily controlled by insurgents”. The story appeared to be given credence on Monday with Mark Stroh, a spokesman for the White House National Security Council, telling Tass that he had information suggesting that Russian military personnel are returning to the Ukraine border. The White House has issued a warning to Russia against using the elections as a pretext for moving troops into rebel-held areas. The Russian economy is already teetering on the brink of a recession, with the IMF forecasting growth of only 0.2% this year and 0.5% next year. A tightening of international sanctions would be a big blow to the country, which is already facing significant budget pressures due to the collapsing oil price. After a week that finally saw Ukraine and Russia reach an EU-brokered gas deal to secure crucial winter supplies to the country these votes could not have been worse timed. While Moscow may be publicly supporting the result, getting dragged back into the conflict will be the last thing they want.